Product prices and availability are accurate as of 2019-04-12 22:25:40 EDT and are subject to change. Any price and availability information displayed on http://www.amazon.com/ at the time of purchase will apply to the purchase of this product. 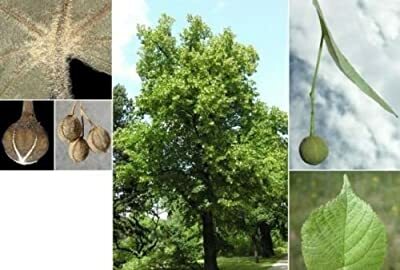 Big Leaf Linden, tilia platyphyllos 100 seeds The Big Leaf Linden is a deciduous tree native to much of Europe. It is frequently planted as an ornamental tree in parks, or as a shade tree or a lawn tree. It is a narrowly domed tree with a moderate growth rate. The foliage consists of simple, alternately arranged leaves. The autumn foliage is yellow-green to yellow. The small, fragrant, yellowish-white flowers are arranged in drooping, clusters in groups of 3 to 4. Their whitish-green, leaf-like bracts have an oblong shape. The flowers are pollinated by bees. The fruit is a small, round, cream-colored nutlet. It has a woody shell with 3-5 ridges. The Big Leaf Linden can reach heights of up to 100 feet. It is cold hardy to USDA zone 4, for a map click here -------> http://www.datreestore.com/usdazonemap.html. Planting instructions can be found on my website.